Showcase your sauces, dips, toppings, and more in this polished, contemporary American Metalcraft MB4 4 oz. stainless steel sauce cup. Dishwasher safe, this durable cup can be reused for daily use at your highly trafficked restaurant, bar, cafe, or catering business. Therefore, this cup is an economical and environmentally-friendly alternative to plastic souffle / portion cups. It also provides an upscale presentation and its shiny exterior matches any decor. Plus, this cup's 4 oz. capacity enables you to control portions and minimize condiment waste. Also, use this versatile cup for appetizer or dessert samplers, hors d'oeuvres, and organization of cocktail garnishes. These are very sturdy and heavy duty sauce cups. They work perfectly for dipping sauces, or for finger foods. Also a good option for children servings. Well these round and stainless steel as advertised. They're also 4 ounces. Great for when a 2 oz sauce cup (or more likely 2.5 oz) just won't cut it. These have been the most awesome sauce cups ever...I have had and used the same set in my pizza shop for 2 years now. Short of people taking them home i have all 24. They are washed 10 times a day and great for salad dressing and sauce...even small portions for the babies. I would repurchase for sure and i might need to if they keep walking out! This is a larger ramekin. We use it for a couple of sauces that go on our fry baskets. For the price, they can't be beaten. Very sleek and classy. They hold more than enough sauce for dipping, so no unnecessary trips back and forth to the kitchen. They are durable and provide a better presentation than plastic souffle cups. Large ramekin that's perfect for salsa because its wide enough that chips fit into it. Works great for any other sauces for sandwiches as well since they can be easily dipped as well. Nice portion cups for serving hummus and spreads and other uses in our cafe. We have a stock of them. They are the best price around! Great little cups for sides of sauce! we also use them for mis-en-place for ground pepper and salt, just the right size. Easy to clean and stack. These stainless steel sauce cups are perfect for serving condiments and salad dressings to your customers. They add that extra little touch to our presentation that plastic cups don't provide! These sauce cups are a perfect accompaniment to any dish that needs sauce! Whether it be wings, pizza sauce for calzones, or any other appetizer needing sauce, these cups make the dish look great and make dipping convenient. Love the stainless steel look, and solid quality. I ordered the 12-pack for this 4 oz sauce cup. The value is great. The manufacturer is American Metalcraft, something that is not advertised. The finish on the item is very consistent and well-made. I was pleasantly surprised considering the low cost. If I have a need for more, I would definitely go for this 12-pack. Love these for salad dressing and condiments. Makes the food presentation so much nicer than the plastic throw away items and keeps the product a little cooler! Good thickness and heaviness. Perfect size for sauces, condiments to be placed on the side of a plate. Good price for the group of these. Nice and big! Perfect for larger servings of sauces and very sturdy. We had another brand crack in the middle but these are holding up to lots of use. These sauce cups are absolutely fantastic. Perfect for ketchup or any other dipping sauces that you love. My favorite is blue cheese with celery sticks on wing night! These are really wonderful little cups. They feel hefty and well constructed. They are the perfect size for a tiny scoop of ice cream or for prepping 3-4 tbsp of ingredients. These sauce cups are ideal as a way of being able to make side portions instead of full amounts. It's also allows for side items like cheese to be kept seperate to be added by the customer. We use these for a lot of different items. Perfect for sauces. Easy to clean and dishwasher safe obviously. We have several sizes of these. Made of stainless steel and holding four ounces, this sauce container has a stable base. It holds salad dressing and condiments like olives as well. This is a phenomenal product. Yes, it's super simple. But they are very sturdy and hold up forever. We use these in all of our locations and they're much better than the wasteful plastic products. We really love this 4oz round sauce cup. It is great for ketchup, mustard, and bbq sauce. The cup is made of stainless steel and is also dishwasher safe. This sauce cup is great for high volume cafe's or restaurants that need a cost effective and durable option. Such a great value. These could even be good for a food truck that wants a little bit more fancy sauce cup if they do not want to use disposable. This is a stainless steel ramekin meant for a 3-4 ounce portion of dipping sauce. The stainless steel prevents rusting and polishes up to a nice shine. Very nicely made cup. THe stainless quality is great. It is just the right size for sour cream and other sauces. Easy to clean and polish. This is perfect for sauces where everyone would need their own. So at home when we have fries I usually put these out for ketchup. They look nice and hold a good amount. Perfect sauce cup for that perfect sized portion of A1 sauce. I don't like to ruin my steak by drenching it in the sauce, so this is the perfect side kick to dip as needed. Bought this cup for dipping french fries, chips, veggies, etc. It's the perfect size for one person – not too big and not too small. This sauce cup is perfect to serve a snack or a sauce for dipping. It is very well made, it is stainless steel so no need to worry about rust. I am very happy with my purchase. 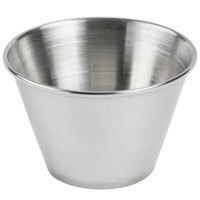 Without a doubt, I would highly recommend these four ounce American Metalcraft stainless steel round sauce cups. Their uses are endless with the durability to match. I appreciate the fact that I can easily fit any condiment with no problems and cleaning after is no problem. I have no complaints, they are great and I would definitely recommend!! I'm the long scheme of things, this item saves hundreds if not thousands of replacing a paper item. We figured they save enough to pay for themselves in one month of use and look excellent. A great portion sized serving cup for condiments and sauces, such as buffalo sauce, ketchup, mustard and others. They are easy to clean and hold up well to rust prevention. Used at our bakery for measuring small amount of Items like baking soda and salt. Works perfect for this. A nice alternative use of the product. I bought this initially thinking it would be too large at 4 oz., but it has been perfect for the tartar served with fish and chips. Our customers were previously always asking for more, not anymore! Good multi use Cup. We use it for cold dressings, hot queso and everything in between. Cleans easy, holds up to wear and tear and repeated use. We were using 4oz biodegradable souflee cups for portioning cheese for all our burritos and tacos and throwing away multiples every day. we switched to these and now there is no more waste and these work way better. Great portion cup! The American Metalcraft 4 oz. Stainless Steel Sauce Cup exceeded my expectations. The quality is excellent and the price is very reasonable. It is actually one of my favorite. I would highly recommend this product. Definitely 5 Stars! This cup is very thick and made out of quality stainless steel. It's easy to clean and you never have to worry about it breaking. Worth having if you need something that will last for years. This sauce cup is high quality and thick. Unlike other brands that have a seem down the side, this cup won't rust or come apart. Nice stainless steel sauce cup. We try to be as low waste as possible and these cups are durable enough to withstand years of use. The American Metalcraft 4 oz. Stainless Steel Round Sauce Cup arrived only two days after we placed the order. They are excellent for condiments and also help you keep everything organize in the kitchen. Great price for a set of 12 metal cups. These 4 ounce stainless sauce cups from American Metalcraft fit the bill for a low cost ramekin/cup. The size is just right for ketchup or salad dressing, whipped butter etc. I gave only four stars due to quality. I purchased some from another manufacturer that were finished nicely, these ones lack some quality control. They were by no means damaged or unusable, but required hand washing before first use to get out al the metal shavings and dust from the manufacturing process. When new, they all already had some blemishes. At this price, it's hard to complain about all that but my comments are again based on comparison to others I've purchased elsewhere. The American Metalcraft 4 oz. Stainless Steel Round Sauce Cup arrived only four days after we placed the order! It is a well made cup that looks great. The American Metalcraft MB4 4 oz. Stainless Steel Round Sauce Cup works great for portion control. You can easily serve 4oz worth of animal crackers to the little ones or to yourself. These are really good quality and classy looking. Used them to hold blue cheese dip for wings. I really like them because they're not tiny and can hold a decent amount. Could be used for any condiment and look nice on the table. Recommended! These sauce cups are great for any side dipping sauce. They have actually inspired me to get a little fancier with my recipes. Great quality, I've had them for about a year now and they have held up well. I would definitely recommend them to a friend. this stainless less sauce cup is just the right size to put sauce in.the cup is very easy to clean and use.i would recommend this product to anyone. Love these cups. Easy to store and they make for a great presentation on the plates. Cleans very easy. A+ again Webstaurant. We will continue using you for our needs. These cups are used in our cooking school for many applications. It's a go to cup and a great size. After a year of use and washing, they still look brand new. Great product! We use these for residential use as dipping cups (ranch, ketchup, etc.) and also end up finding other uses for them including vitamin cups, mixing small amounts of essential oils, salves, collecting bugs, flowers and other things. They are useful for things I never had intended, but I am so glad to have them handy. Love these Sauce cups. We had been using a plastic cup before for our baked beans, Au jus, etc..., the presentation on the plate is so much better with these stainless cups. In the long run they will save us money also! Definitely a great product. American metalcraft puts our a great product and at a low cost. Would highly recommend to any business. Price is extremely good! We use these extensively when serving marinara with our calzones and strombolis. The 4 oz. portion is perfect, and the stainless steel provides a smart, durable finish that is easy to clean, doesn't transfer heat too badly, and gives a more upscale presentation. I purchased these to store dips and AU jus for table service. The cups, are brushed stainless and clean very well, I really like the volume, is perfect for small appetizers or to serve in the center of a platter, as a dipping bowl. Very nice addition to my BBQ parties. Cute little cup for dips, chutneys, butter, jams, and nuts. Easy to clean and light in weight. Gleams beautifully. Quality is good and price is very reasonable. These are nice little cups for offering a variety of sauces to go with hors d'oeuves like fried artichoke fritters or hot and fresh chicken tenders!! These are super handy for sauces and mise en place but they are absolutely vital for a lobster boil. Great so that everyone can have their own individual cup for dipping.